Spinosaurus teeth are a great value for the collectors of dinosaur teeth. You get more tooth for your dollars than with any other dinosaur teeth, and everyone loves dinosaur teeth. Its like they were made to impress us. The spinosaurus teeth we have for sale make the perfect gift for that budding paleontologist or the adult with a zeal for natural history. Our larger teeth have some repair or wear that makes our incredible prices possible. The smaller juvenile teeth are a great value. They often have no repairs and are in very good condition. These teeth come from the Kem-Kem area of Morocco. They are about 90 to 110 million years old. This huge theropod lived during the mid-Cretaceous Period of the Mesozoic Era, in what is now Northern Africa. At that time the Sahara Desert did not exist! Instead Northern Africa was lush, with rivers, lakes and wetlands. This carniverous dinosaur lived mainly on fish. Some scientists believe that spinosaurus was so well adapted to a watery environment that it could swim! 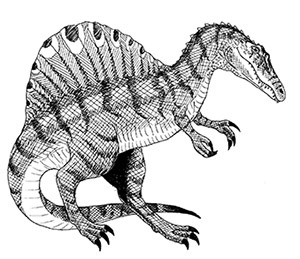 Spinosaurus was one of the largest of the theropod dinosaurs measuring as much as 56 feet long. It could weigh as much as 9 tons, (18,000 pounds). Theopods walked on two legs, had 3 toes on its hind feet, and had lizard hips, (saurischian). The first spinosaurus skeleton was discovered in 1912 and described by a German Paleontologist named Ernst Stromer in 1915. Sadly these fossils were destroyed in 1944 by a British bombing raid of Munich in world war II. At the time this was the only known specimen. More recently other specimens have been found though so far we are still waiting for a complete skeleton. Learn more about spinosaurus teeth.